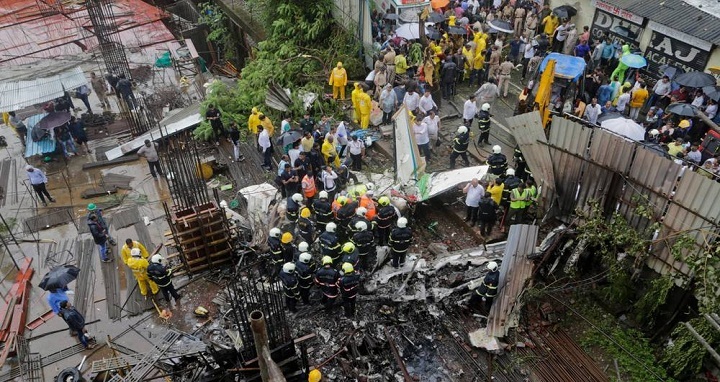 Dhaka, 28 June, Abnews: A chartered plane crashed Thursday in a busy area of Mumbai, India's financial and entertainment capital, police said. News reports said five people were feared dead. Police said it was not immediately known how many people were on board the aircraft. It crashed near a multistory building under construction, they said. India Today television said the plane crashed in the Ghatkopar area as it was preparing to land in Mumbai. It said a pilot, three passengers and one person on the ground were feared dead. Television images showed parts of the wreckage burning on the ground. Police and fire engines were at the crash site.